The global electric bus market is expected to grow at a CAGR of over 27.5% during the period of 2016-2023. These buses, with zero emission, are more environmentally friendly as compared to conventional buses. The ability of these buses to reduce dependency on fossil fuels and emissions will lead to its increased adoption during the forecasted period. With technological advancements in automotive sector, governments of different countries are trying to minimize the pollution. Cars, cabs, and buses used for commute facilities are heavily contributing to air pollution today. According to World Health Organization (WHO), in Europe, nearly 100,000 deaths per year accounts to air pollution, reducing life expectancy by an average of one year. To overcome this, governments of different countries are striving to curb the menace of air pollution. Due to this factor, different emerging countries of Europe, such as U.K., Germany and France are projected to be leading markets for electric and hybrid electric vehicles. This drives the market for electric buses. In addition to this, unstable fuel prices and depleting crude oil reserves are adversely affecting the transportation departments and transit agencies globally. However, high initial investment in the manufacturing of the electric buses is generally retaining the growth of the market. The different segments of global electric bus market are based on technology, size and region. On the basis of technology, the electric buses are mainly classified as pure electric bus, Parallel hybrid bus, Series parallel bus and Series hybrid bus. Pure electric bus mainly operates on batteries, whereas, hybrid electric buses operate on electric propulsion system and conventional fuel. Hybrid electric buses are dominating the market segment in the forecasted period. Whereas, the pure electric bus market is estimated to dominate the market due to public and government interest in emission-free transportation. On the basis of size it is classified into above 10 meters electric bus and below 10 meters electric bus market. Asia pacific is dominating the global electric bus market. Emerging China market in automobile manufacturing is the key factor for the growth of APAC. Due to the clean transportation drive in parallel to rising population, government of China is expected to remain in the dominating position in manufacturing and adoption of electric bus during forecast period. However, North America and Europe are the fastest growing region. Different countries of Europe such as U.K., France, and Germany are estimated to maintain prominence in electric bus market during forecast period.. 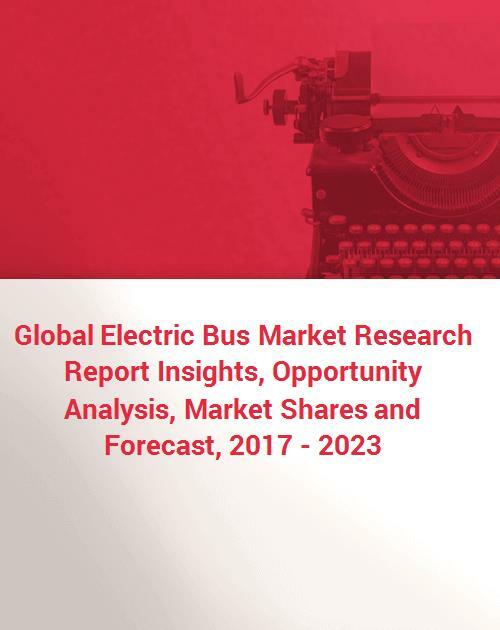 The growth in global electric bus market is also influenced by the presence of major players, such Proterra Inc. (U.S.), Solaris Bus & Coach S.A. (Poland), Ashok Leyland Ltd. (India), Ebusco (Netherlands), Alexander Dennis Limited (United Kingdom) and other. Collaborations and partnerships are some crucial strategies adopted by these major players to gain competitive advantage in the market.